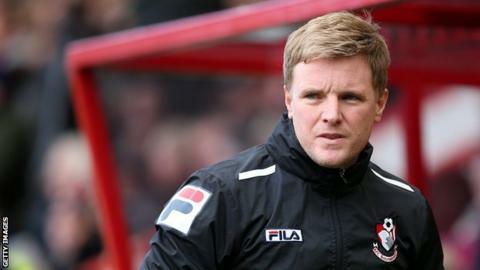 Bournemouth moved to within two points of the Championship play-offs with a win over promotion rivals Reading. Winger Matt Ritchie opened the scoring for the Cherries, who have won five matches in a row, with a shot from inside the penalty area. Ritchie doubled his side's lead after 20 minutes with a close-range finish before Yann Kermorgant's header made it 3-0 on the stroke of half-time. Hal Robson-Kanu scored a consolation goal for Reading in the second half. Bournemouth have won eight of their last 10 games, including all of their last five. Reading hold the final play-off position in the Championship but saw their five-point lead narrowed to two by Bournemouth, Ipswich and Brighton on Tuesday. Bournemouth, who were promoted to the Championship this season, have won eight of their last 10 games, with their only league defeat at home since mid-December coming against Leicester on 1 February. The Royals, meanwhile, will be glancing anxiously over their shoulders, despite having lost only two of their last nine matches, after being comprehensively beaten by their hosts. A resounding finish from Ritchie from the centre of the box after good work by Lewis Grabban gave Bournemouth the lead. The lead was doubled when Ritchie side-footed home from close range from Andrew Surman's pass, after Grabban's shot was blocked, and Kermorgant's header put the Cherries firmly in control before the break. Marc Pugh and Grabban went close with second-half efforts as Bournemouth continued to impress. But Reading pulled a goal back through Robson-Kanu's powerful shot from 20 yards. "I can believe we are here as I've seen how hard the lads have worked. We didn't expect it but why not seize the moment and see where we can go? "It is in Reading's hands. If they win their five games, they are in it. We've always believed we have really good players and now we have the goals to justify me saying that. "It was an incredibly hard-working performance and probably the quickest game we've played in this year." "There is a hell of a long way to go. We have to keep the group together and keep positive. We've got to keep going because we are very much in this race. "I'm very positive in my outlook and we have to show the spirit and desire to go for the next game. "Give Bournemouth all the credit, we are not looking to make any excuses. They were very good on the night, especially in the first half and took their goals well." Match ends, Bournemouth 3, Reading 1. Second Half ends, Bournemouth 3, Reading 1. Substitution, Bournemouth. Shaun MacDonald replaces Matt Ritchie. Attempt missed. Yann Kermorgant (Bournemouth) right footed shot from outside the box is too high from a direct free kick. Attempt blocked. Matt Ritchie (Bournemouth) left footed shot from outside the box is blocked. Assisted by Yann Kermorgant. Substitution, Bournemouth. Brett Pitman replaces Lewis Grabban because of an injury. Delay in match Lewis Grabban (Bournemouth) because of an injury. Eunan O'Kane (Bournemouth) wins a free kick in the defensive half. Offside, Bournemouth. Yann Kermorgant tries a through ball, but Ryan Fraser is caught offside. Goal! Bournemouth 3, Reading 1. Hal Robson-Kanu (Reading) left footed shot from outside the box to the bottom right corner. Assisted by Pavel Pogrebnyak. Substitution, Reading. Nick Blackman replaces Royston Drenthe. Attempt missed. Lewis Grabban (Bournemouth) right footed shot from the right side of the box misses to the left. Assisted by Yann Kermorgant with a through ball. Attempt missed. Lewis Grabban (Bournemouth) right footed shot from outside the box is close, but misses the top right corner. Assisted by Eunan O'Kane. Lewis Grabban (Bournemouth) wins a free kick in the attacking half. Foul by Ian Harte (Bournemouth). Jobi McAnuff (Reading) wins a free kick on the right wing. Substitution, Reading. Stephen Kelly replaces Wayne Bridge. Substitution, Reading. Mikele Leigertwood replaces Adam Le Fondre.